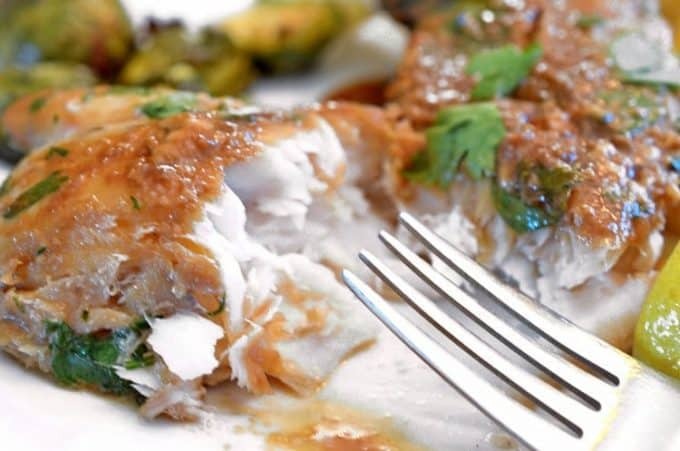 This Healthy Haddock Recipe with a ginger and soy-based glaze will throw your taste buds into overdrive and leave plenty of calories for dessert! Try these baked haddock fillets with an Asian twist tonight! 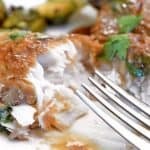 This healthy haddock recipe features baked haddock fillets with an Asian flair, thanks to the classic combination of fresh ginger and soy. I love seafood but have to admit that I eat far too little of it. It’s one of the things I love to order in restaurants because it seems we just don’t make it often enough at the house. It’s simple and delicious recipes such as this one that cause me to ask myself just one question: Why? 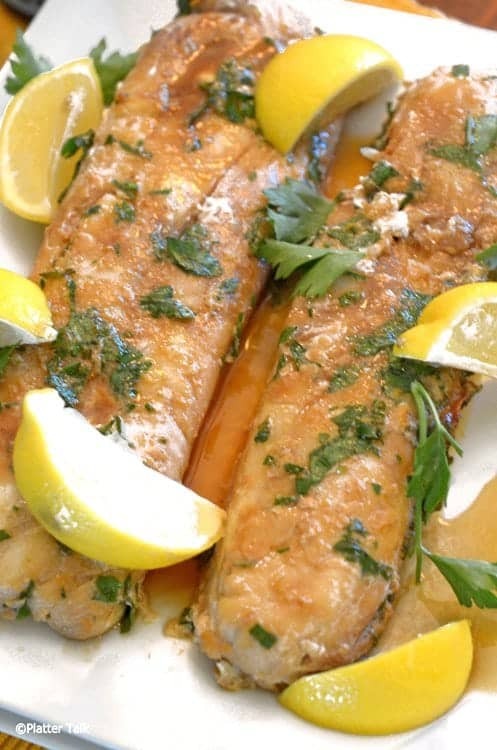 This baked haddock fillets are bathed in a fresh ginger, soy sauce, lemon, and chopped fresh parsey. This makes for a beautiful and healthy haddock recipe. I suppose I’m fortunate in the sense that I grew up eating fish. Summers were spent at our family camp in the beautiful foothills of New York State’s Adirondack mountains where most days found me fishing in the Independence River, whose fresh waters swooshing over the vast bed of rocks helped all of us fall asleep each night. It was there that I learned to love the taste of fish and I’m proud to say a good share of the trout, bass, sunfish and bullhead fried up by my mom was caught on one of my hooks. Over the the years and by contemplating countless restaurant menus, my palate’s taste for seafood has expanded. Shrimp, scallops, mahi-mahi, sea bass, crab legs and of course lobster – I love it all. 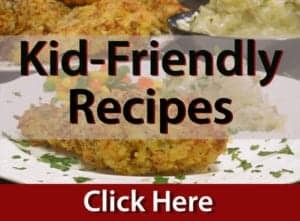 Let’s not forget salmon, perch (very prominent here in Wisconsin), walleye, and this recipe’s feature: Haddock. It’s lean, it’s mild, and it’s versatile. It can be be deep friend, fried in beer batter, broiled, or as in this recipe baked. The fresh ginger in this marinade along with soy sauce, lemon and chopped parsley give a solid flavor to this otherwise light-tasting fish. Scott, who is only half “sold” on eating fish of any kind wolfed down this healthy haddock recipe. We paired these baked haddock fillets with some oven roasted Brussels sprouts and baby red potatoes and once again I found myself asking, “Why?” Why don’t I make seafood more often? Be Sure and Try our Pan-Seared Scallops, Alton Brown-Style! Do you like sea scallops but don’t know how to make them? Don’t miss this healthy seafood recipe! 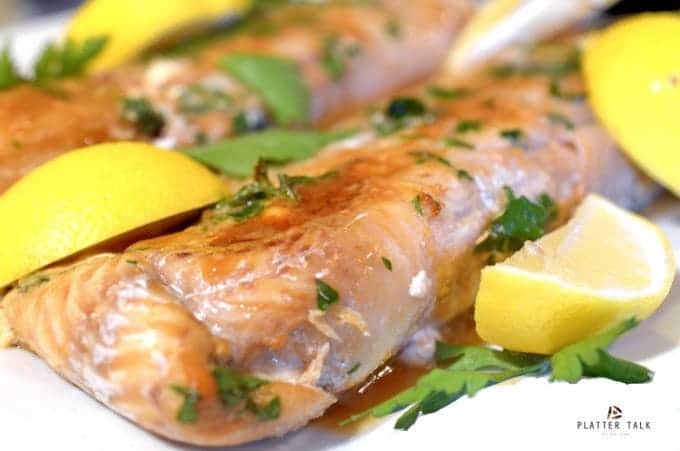 These baked haddock fillets are bathed in a marinade of fresh ginger and soy, all accented with lemon and chopped fresh parsley. Make this healthy haddock recipe today! Combine ingredients for marinade in small mixing bowl. 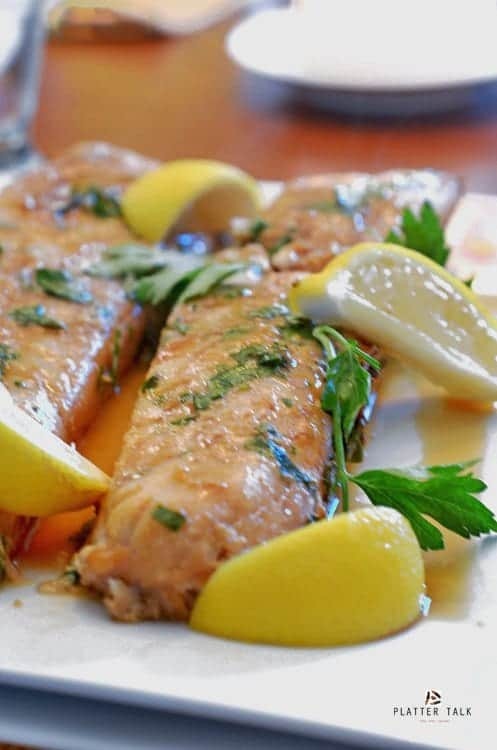 Arrange haddock in 2 inch deep dish and pour marinade over fish, turning fillets to ensure they are well soaked. Cover dish and refrigerate. Allow to marinade for 1 hour, longer for fuller flavor. 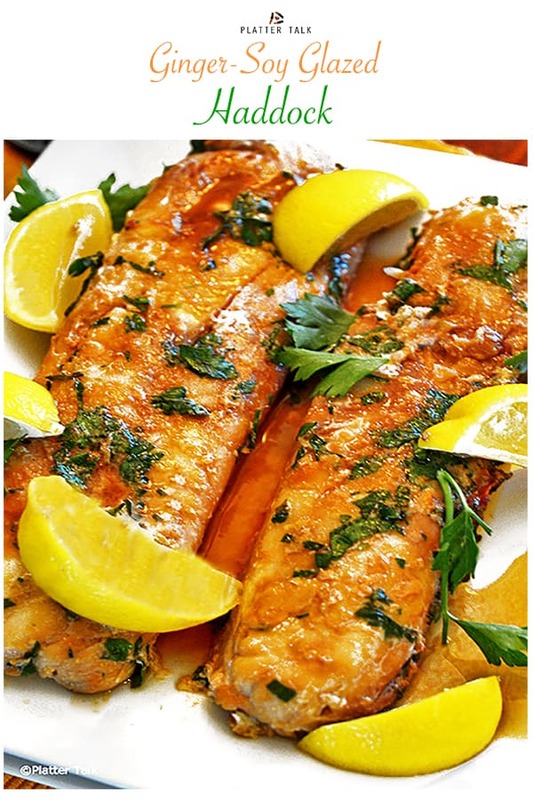 Bake fish in marinade for 25 minutes, or until cooked throughout and tender and flaky. Serve haddock on warm plates, spoon juices from pan over each serving. Thanks for the meaningful comment. It is yummy. And so much more. Oh my this looks so amazing !! This dinner sounds right up my alley. We love haddock and the added flavors in this really step it up. Thanks, Tanya. We think you will love this healthy haddock recipe! 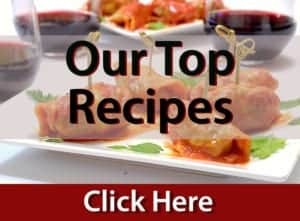 I’m trying this awesome recipe today .. I’m trying to marinade longer but all my research leads me to see that there is a strong caution against marinading for more than 1 hour because the citrus will cook the fish and it will turn out mushy ..does anyone have any experience with over – marinating ? Thanks for the great comments and insight, Angela. 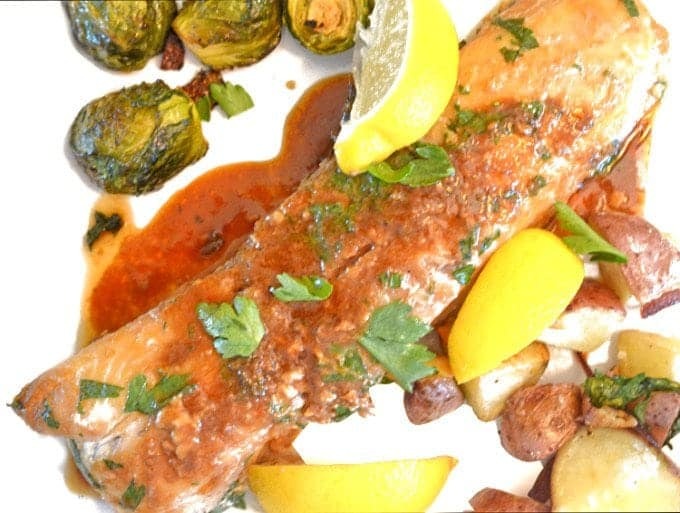 We hope you enjoy this healthy dish from the sea! This was very good and as stated – even if you aren’t a lover of fish you will like this one- my non fish eating son loved it! So I’m Haooy! ???? Thanks so much for the feedvack! Now guys, you KNOW this is my kind of dish! What time is dinner? I was up in your neck of the woods last week, and I brought a 5 lb. box of Icelandic Haddock back to Atlanta with me! Can’t wait to try this recipe with some of it! Kim, How great to hear from you! Enjoy your autumn and your haddock down in Dixie! You know I am a lover of seafood and Haddock is a good meaty, white flaky fish that can hold up to a host of ingredients. This is a beautiful recipe my friend. Thanks so much for the comments, Patty!